Saturday April 13, 2019-The Wiper Democratic Movement (WDM) has once again faulted the Orange Democratic Movement (ODM) over its conduct in the just concluded by-elections in Ugenya and Embakasi, saying it is to blame to the loss. The Kalonzo Musyoka-led party took issues with ODM's utterances during the campaigns, accusing some of its leaders of insulting the party and its leadership. Mavoko MP Patrick Makau picked up on ODM Secretary General Edwin Sifuna for allegedly hurling the insults. He warned that the same could lead to a separation, considering that the two are sisters in the National Super Alliance (NASA). "It was unfortunate and expensive that a coalition member party took us through all that. “I want to tell ODM that we have seen the insults that you hurled at us and at our party leader, we are not going to do business as usual," the MP was quoted as saying. 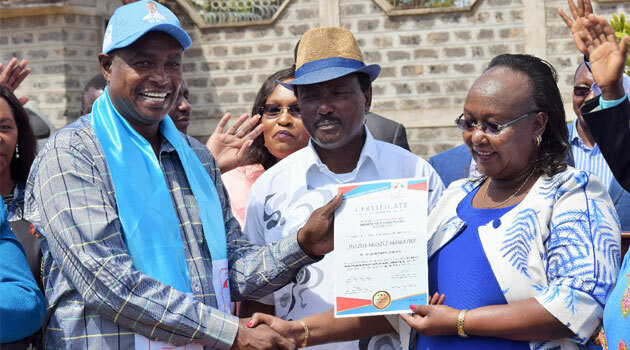 His remarks were echoed by the Embakasi East MP-elect Julius Mawathe, who vowed to see to it that Wiper cuts links with ODM should Sifuna not be tamed by his party. "Sifuna is a huge disservice to the party (ODM), if he continues like that I will make sure that we do not walk together," he said.